TERRY DULLUM: The Dullum File — You Want Sugar With That (Lefse)? Lefse season is well under way. Lefse-making season and, for me, lefse-eating season. For those unaware of the potato-based Norwegian delicacy, I would just say I feel very badly for you. But if you are very, very good, when you die and go to heaven, I believe, waiting for you there just inside the Pearly Gates will be a nice warm, freshly made batch. But with lefse season comes the age-old question, is it proper to eat lefse with sugar? Butter, yes. But sugar? We did what we always do when facing this kind of moral dilemma. We put the question to our Facebook friends. They seemed hungry (pun intended) to respond. So far, we’ve gotten almost 500 FB comments, more even than my recent posts making fun of Sarah Palin. Jay Thomas even did a segment of his Fargo radio show on the question Thursday. At least he told me he was going to. I didn’t actually hear the program yesterday. Sorry, Jay, but it was nap time. Here is a sampling of the sugar/no sugar comments we got. Ruth Omdahl Callahan: Sugar and butter … duh! Vernon Keel: Butter AND sugar, for sure (My grandpa told me so). Kenneth Cotton: I like a little lefse with my sugar! Becky Jones Mahlum: Butter and brown sugar. Connie Santwire: Sugar for sure. Ya, you betcha. Carolyn Nelson: Butter, sugar and cinnamon. Kristie Preston-Sauvageau: Butter and sugar for breakfast, butter only when eaten for lunch and dinner. John Reitmieir: Not only is it BUTTER and SUGAR but it has to be Land O Lakes Butter and Crystal Sugar, or you’re not getting the full effect! Leonora Gershman Pitts: What kind of monster doesn’t put sugar and butter on their lefse? Marcus Woodard: I take my lefse neat. I have to say I was surprised by the outcome of our unscientific poll. Without actually tallying the responses, which seems like it would be a lot of work, people who prefer both butter and sugar hold a slight majority. Beyond the sugar question, some suggest some more adventurous choices. Marilyn Lauer: No sugar but like it with egg salad. Robert Fladeland: Peanut butter and sugar. Lyle Knudson: BUTTER AND CHOKECHERRY JELLY! Laura Peterson: Sugar or lingonberry jam. Nicole Quam: Deer jerky and mustard. Jeff Shirley: Yesterday I heard they use sour cream and jam in Norway … Hmmmm! Terry Hjelmstad: I wonder how salmon, cream cheese and capers would be? Would somebody try and let me know? Back to the sugar debate for a moment. I have to say I was quite taken by the “you can’t do this wrong” kind of attitude expressed. I haven’t seen so much openness and acceptance since well before the most recent election cycle. Perhaps there is hope for our country yet. But there are always exceptions. We end with one of them. 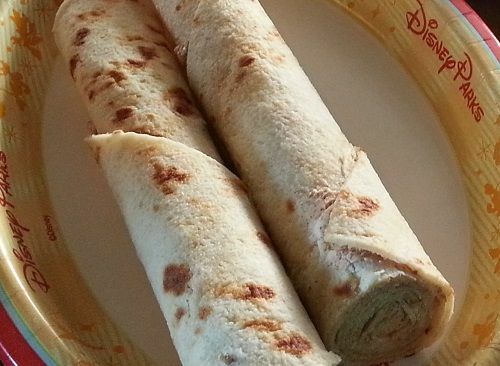 Zak Skaro: If you put sugar on lefse, you are weak, your bloodline is weak and you will not survive the winter.